Past meetings suggested a closely-fought encounter would be expected in this derby clash. However, this was not to be the case, as there was only one side in it. Hawick Waverley were on track throughout, while Hawick United were well and truly off the rails. 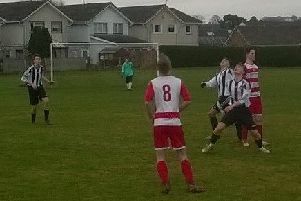 In gaining full points, Border Amateur League ‘A’ Division table-toppers Waverley took a step nearer winning the same title they lifted last season. After being set up by a Dean McColm pass, Paul Hossack then came near to finding the net with a long-distance drive. Waverley continued to push forward and, in the 29 th minute, got a reward for their efforts when Jordan Yardley netted. United fell further behind two minutes later after another Yardley strike. 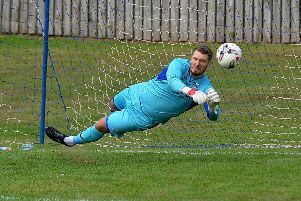 United then threatened for the first time with a good move which ended in Waverley ‘keeper Ali Willison saving a Kevin Paterson header, following a David Slight cross. The Waverley were in the driving seat and it came as no surprise when Mick Hope’s troops went further ahead. Man of the match and midfield general Hossack did the business with a sweetly-struck drive two minutes from the break. The second period follow a similar pattern, with Waverley dictating matters. Goals were scarce, though, until the closing stages of the game, when they arrived at flood force. Dean McColm started the flow in the 82nd minute when shooting home from close range, after United keeper Dean Fry had blocked a Ryan Clapperton shot. United hit back to open their account two minutes later. On breaking down the right, Sean Clarke whipped over a cross which was stuck away by Kevin Strathdee. The game was not quite over, though, for two minutes into injury time, substitute Simon Philbin put the final nail in United’s coffin in beating Fry with an angled shot.